Within the first twenty seconds of the show, we see multiple crimes happen in one spot before Cobblepot’s eyes after he declares, “Home.” This serves as small dramatization of what the entire city is actually facing with the mob running the city and cops letting crime run loose. With the lawmen not doing their jobs, this gives way to vigilantism as the result. The Balloonman is first of many vigilantes this show will see. 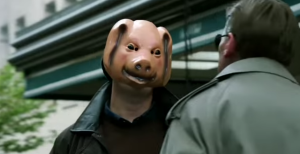 In trailers, he was seen wearing a pig’s mask which lead many comic savvy people to believe he was Professor Pyg. Come to find out, that was merely a tease. Although it was not who many thought it was, it is notable that this is the first “masked” vigilante as well. This episode dealt heavily with the theme of what people deserve. With the death of the first criminal, Bullock was perfectly ok with the vigilante stringing him up with a weather balloon saying, “It’s what he deserves.” Gordon automatically questions that mentality and asks one of the cops, “Don’t these criminals have rights?” The change in the GCPD’s sentiment towards the Balloonman noticeably shifts after he kills a dirty cop. Suddenly, the Balloonman becomes top priority because apparently nothing is worse than a cop killer. The Balloonman shares in the mentality of people getting what they deserve which Bullock brings up towards the end of the episode. Here, the similarities between the cops, criminals, and vigilantes convene. Gordon’s character is turning more into the leader he will become as he starts to tell Bullock what to do. Justice is his sole reason for continuing as a cop. He seeks to do everything he can to make that happen which is why he is the only cop that actually looks closely at case facts instead of jumping to conclusions like Bullock. Revisiting the Waynes’ murder case will be the ongoing example of this for the show it seems. It keeps getting mentioned, but each episode only spends about five minutes tops on the Wayne case. The Penguin is back in Gotham with absolutely nothing, and he is killing his way to the top. He even kills a guy for his shoes because he needs them for a job. Speaking of which, the job is a restaurant owned by another crime boss, Maroni. 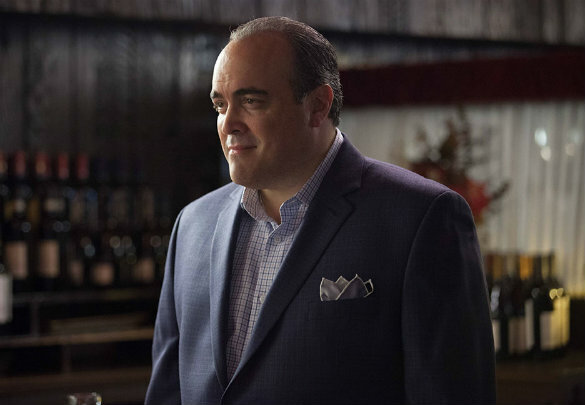 Penguin finds himself on Maroni’s good side fairly quickly whom Maroni sympathizes with because, like Penguin, he too started with nothing. 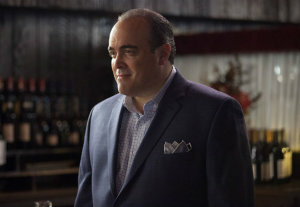 As Maroni causes more trouble for Falcone, the Penguin will be riding that train to the top. I enjoyed Bullock’s montage as he worked the streets to find the guy who stole the weather balloons to sell to the Balloonman. Bruce Wayne is starting to become more interesting as a character as he becomes more interested in martial arts, detective work, and vigilantism. However, I don’t expect him to much more impactful on the show than that. Gordon’s girlfriend Barbara faces doubt this episode thanks to Montoya, her ex-lover. What’s a drama without a complicated love triangle? Anyway, this doubt is quickly resolved by the end of the episode. Barbara has not been very involved story-wise which I am sure will change once Gordon becomes a more acting force against the mob. Everyone has secrets that they not willing to share, and sooner or later, those secrets are going to get out and start causing problems for Gordon. As the episode wraps up, I loved the Balloonman’s last words to Gordon after he was asked who the next target was: “Does it matter?” This idea that no one is good in Gotham City is a recurring point that keeps getting paired with the need for Gotham’s savior (*cough*cough*Batman*cough). In the meantime, things are going to get a lot worse before it gets better. Right now in the show, things have rapidly gone downhill since the death of the Waynes. In Falcone’s words, “The Waynes and the Falcones were the two pillars of Gotham.” With the Waynes gone, control is up for grabs. This mirrors the weather balloon crimes in that what goes up must come down. A city built on corruption might do well for a time, but it will inevitably revert to chaos. The show seems to still be in setup mode. This episode saw a new addition with Maroni, another name drop of Arkham, and the steadily increasing degree of crazy in Gotham City. I enjoyed this episode as means of fleshing out some characters, but the plot seems to be holding its breath at the moment before it unleashes “the war.” Until that time comes, more setup and development as well as the villain of the week will be my only expectation. I am looking forward to Penguin’s relationship with his “old friend” Gordon will turn out.